One nap of her hair is the only perfect circle in nature. 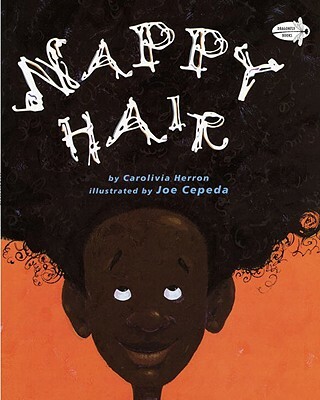 I recently purchased Nappy Hair and have read it to my daughters. I must say calling this book “racially insensitive” is absurd. Please don’t let politically correct school officials, or distorted media coverage bias your (our) opinions of what is or is not good for our children. After viewing local TV coverage. A portion of a picture from the book, which was flashed on the screen, reminded me of one of those grotesque Black caricatures from the past, the claims by some of black parents, supported by a prominent black minister that the book was ‘racist’ and the school’s subsequent decision to suspend the teacher would easily lead one to conclude that this book is indeed racist. Someone once told me unless you get your news from 9 different sources you are being lied to. Same goes for the coverage of the so called Nappy Hair controversy. Please check out the book for yourself, and make an informed decision. Joe Cepada’s illustrations are excellent. The story is based upon tapes of an actual story as told in Herron’s family. As a result it reads like a familiar childhood memory. I did however find the call and response style tough to read aloud to my kids (you have to change you voice to make it clear to the listener that it actually a different person speaking – takes practice). I definitely recommend it for a young person’s library. We are fortunate to have such a wide range of books which speak to Black experiences and culture. Herron’s book is a fine example. The only problem which remains is getting the word out about these books. I must admit I was not aware of this book prior to the news story. One goal of the AALBC is to get the word out, in a positive fashion, about Black books. It is almost scary to think the same mentality which suspended an teacher could have potentially snuffed out a book like Nappy Hair before we even discovered it. Read Dragonfly Books’s description of Nappy Hair.